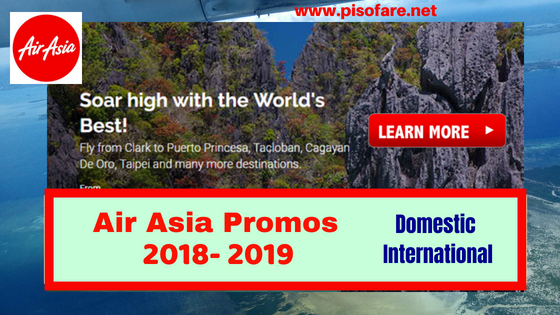 Are you looking for 2018 to 2019 promo fares? Check the new Air Asia seat sale for the remaining months of 2018 and extended to January 2019! New Air Asia promo tickets to local and international destinations is now available for booking until August 19, 2018. The ongoing Air Asia promos can be used for travel from August 6, 2018 until January 31, 2019. Featured on this sale are the new flights of Air Asia going to and from Cagayan De Oro. Promo tickets Cagayan De Oro to/from Manila, Cebu, Clark and Iloilo. Air Asia promo fares Cagayan De Oro starts at P490. Sale tickets to or from Cagayan de Oro are valid for trips from October 28, 2108 until March 30, 2019. Avail Air Asia sale tickets for near flight dates. However, advance booking is required. Limited Air Asia promo fares on sale! Book your ticket fast! Air Asia promo tickets are on limited availability and may not be available on all flights. Quoted Air Asia sale tickets are valid for one-way trip and cover the fare, Aviation Security Fee, VAT, Domestic Passenger Service Charge and free 7 kilos hand carried bag. Calling the airline hotline at phone # (02) 722 2742 from 7AM-11PM. Buy the low fares at Air Asia ticket offices in airports. Prepaid Baggage is cheaper than paying in the airport. Baggage rates are also lower when you buy it during initial booking than purchasing it after initial booking. Need more promo fares and cheap flight updates? For more updates on airline seat sale of Air Asia, Cebu Pacific Air, Philippine Airlines and travel updates, LIKE our Facebook: PISO FARE TICKET!